The WHO has defined life skills as, ‘the abilities for adaptive and positive behaviour that enable individuals to deal effectively with the demands and challenges of everyday life’. 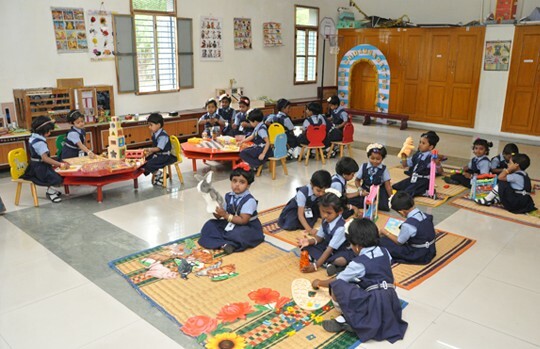 The key objective of life skills programme at our school is to build these abilities in the students. This program enables the students to make themselves a better person on the whole. TThe school’s total Health Program had been started on October 7, 2006 to empower young children with the knowledge, attitudes and skills required for a healthy living. How Paramount it is to possess good health! Through environmental education, the students are introduced to the role that the environment plays in shaping the life and surroundings of the human beings. The message for the need to safeguard the environment reaches the students from early years. Rajya Purashkar Award has been won by 19 students and Rastrapathy Award has been won by 7 students so far. Yoga trains the mind and soul of the students. Students from KG to Std. X are taught Yoga in the school. Our students have achieved National and International titles in Yoga. The “QUIZ CLUB” of our school which is named as “Interrogative Club” is working during 12.00 p.m. to 12.30 p.m. in our school premises. The motive of this club is to make the students get wide knowledge in all subjects and enable them to participate in “Quiz Contests” efficiently. Instrumental music classes are conducted in the school premises. Students are taught to play Keyboard and Guitar by a skillful musician. Students are made to expose themselves to our traditional dance ‘Bharatha Natiyam’. A dance teacher is appointed for the same. The students display their talents in dance in and around the town. To make our students Well- versed in financial education, “Chutti Crorepatti Club” was inaugurated in our school premises on February 4th 2011, with our principal as Chairmen and under the guidance of Mr. V.V.V.A.Mahendran, who is one of the non-executive member of the club. 4 Teachers are elected as directors of the Club. Students from L.K.G to std X are divided into 4 groups and named as Warren Buffet Association, Peter Lynch Association, Rakesh JunJunwalla Association and Robert Kiyosaki Association. Two students from std III to Std X are selected as board members for each group. C.E.O (Chief Executive Officer), C.F.O(Chief Financial Officer) and C.I.O(Chief Investment Officer) are from std X. Four teachers are elected by the students as mentors for each group. The members of each association has Rs.20,000(Virtual money). (ie) Each association has Rs.80,00,000 virtual money in bank. The face value of one unit as inception is Rs.10. So, each member is allotted 2000 units valued at Rs.20,000 (2000xRs.10). The total fund collected from members are invested by the C.E.O,C.F.O and C.I.O’s of each association separately in different asset classes like property, Gold, Bank deposits, Insurance and shares by getting ideas from Board members, who have already got ideas from each member of their association. Two board meetings were held after 2 fortnights and the board members discussed about their investments. The intention of investing in different asset classes is to learn how the return on investment(ROI) is in each asset class over a long period of time.